Foto Bhuna Gosht recipe by Athena at DesiRecipes.com. Powder the cardamoms keeping their skins. Finely chop the ginger . Now fry the cardamoms and ginger till golden brown. Add the mutton chops and salt and continue frying. When the water from the mutton dries up add the pepper and coriander powders. Fry for a few more minutes and then add sufficient water to cook the mutton. 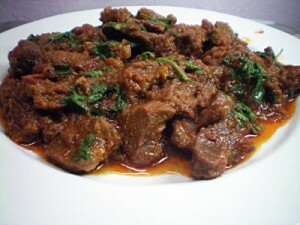 When the mutton is tender add the wheat flour and water paste to the mutton to thicken the gravy. When ready, sprinkle the chopped coriander leaves .